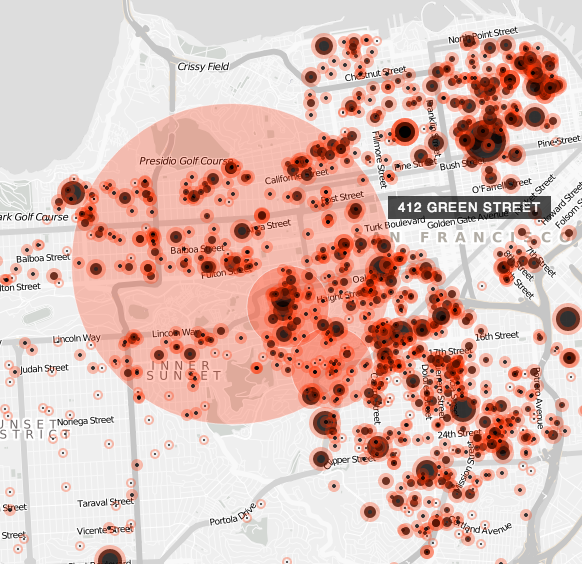 Image by the Anti-Eviction Mapping Project. The Anti-Eviction Mapping Project does more than make colorful maps and rally to protest tech buses. Today the group released “Dirty Dozen,” which profiles 12 people who they claim to be the “worst evictors” and misusers of the Ellis Act. Check it out here. Your use of the word “misusers” (apart from being horrible English – “abuser” is closer to what I think you mean) presupposes a premise that you have made no effort to substantiate. I personally know three of the people on that list and what is common to all of them is not so much a predisposition to malice but rather that they own a lot of properties. So your conclusion really should be that people who own a lot of rental units tend to Ellis more than people who do not own a lot of rental units. In other words, a big fat old “duh”. Amazing how these crooks have manged to abuse the Ellis act. Chetcuti was running a fraudulent Ponzi scheme with Jonh W. Simonse. Defrauded many investors in the process. Good to expose this filth AND their friends and associates. I hope jail is in their future. Why? Those Ellis evictions look perfectly legal to me. Chetcuti purchases buildings with real investor’s money. Keep in mind that Chetcuti is running a Ponzi scheme. Properties acquired with the intent to commit fraud. Chetcuti immediately fraudulently transfers titles of the various properties to associate John W. Simonse. Investors try to get their investment with no luck. No property titles under Chetcuti. Chetcuti and Simonse proceed with Ellis Act evictions on FRAUDULENTLY acquired properties. More than 55 evictions. 25 on Woodward St/ (the street is only one block long). They should be in jail. Nothing more than ottom feeding scum. You know at least three?? WOW- but not surprised. The article indicates no fraud. BTW, I didn’t say I knew them well. Certainly not friends. But I’ve met them and am acquainted with them. The article is just a list of offenders but some of the offenders have a long history of fraudulent activity. BTW, this lawsuit on Chetcuti sure reads like an episode of American Greed. Which it is. I’m not sure you’re mentally stable John. You treat every comment made on these posts as a threat, a challenge to you or your situation. This isn’t a debate class. I have pity for you. Karma will catch up with you and all these lawbreakers. This comment highlights the abuse. The stated purpose of the Ellis Act is to allow landlords the opportunity to exit that business. Instead, owners use it as one of the tools in their chest to empty buildings of tenants in order to maximize profits. Picking and choosing, not exiting the business. In fact, the current trend is to buy a building and immediately impose the Ellis Act, which contradicts the spirit of the law. “I am entering a business in order to take legal action to exit it because it is too burdensome.” Ridiculous on its face. This abuse and perversion of the stated purpose of the law cry out for reform. I’d like to see an analysis of the imposition of the Ellis Act by city throughout California to confirm that it is a state law that supersedes the authority of local communities to regulate the allocation of basic human needs. Why should legislators in areas where the Ellis Act has never been needed have the right to tell local officials in cities where property owners abuse it how to institute the will of their residents? The current crisis demands strong community resistance. Let’s keep pushing the envelope of the possible. No, the process is legal and correct. If a LL wishes to exit the rental business, he really only has 2 options. Either he does an Ellis himself or he sells to someone who will. The end result is the same either way. It is merely a matter of whether the owner wants the hassle of an eviction or whether he gets someone else to do it for him. The real point is that the building is either viable with existing rents or it is not. If it is not, then it is going to get Ellis’ed regardless. They key to avoiding Ellis is to pay a viable realistic rent. The current rent control regime has contributed to some of the highest rents in the country AND housing insecurity. What a farce. So you’re saying with a straight face that if rent control was abolished that rents would DECREASE? I know you aristocrats think the little people are gullible, but they’re not THAT gullible! No, the solution is stricter controls on minimum and maximum per-square-foot rental prices and the addition of commercial property into the rent control regime. In fairness to landlords who are saddled with long-term tenants who are paying super low rents, I support guaranteed minimum rents (e.g. $1.25/sq ft per month), with government rent-aid in the cases where this causes tenant hardship. This aid could come from a small tax on real estate profits. The goals of public policy on housing should be pretty simple: regular people having a place to live without giving up most of their paycheck for rent, and landlords making a reasonable profit. The answer to your question if “yes and no”. Some rents would go up, obviously. But market rents would come down because there would be increased supply. All those units that are being held off the market would come back on stream, leading to a glut of availability. That was exactly the experience when Boston was forced to abolish rent control by State order. That said, i like your idea of establishing controls based more on the circumstances of the building rather than tenure as at present. But a better approach to a “per square foot” rent is to take into account an owner’s actual costs. A rent that is viable if you have owned the building for 30 years is a nightmare for someone who has just bought the building. Which is why so many Ellis evictions happen with recently-bought buildings. So maybe a minimum and maximum ROI for the owner? Ellis would have to remain as an option, but we would see far fewer Ellis evictions if there were a “guaranteed minimum rent or ROI”. Finally, I do not believe that commercial rent control would ever be allowed or passed. In fact, I know of nowhere in the US where that happens, but am willing to be proven wrong on that.